Wind power got a huge vote of confidence earlier this week when what is often described as the most influential newspaper in the English-language world published a story saying the industry has made huge improvements in the past 15 years. In a story headlined “Wind Power Gains as Gear Improves,” The New York Times article also said experts acknowledge that even greater improvements in wind technology are planned for the future. As an example, the article quoted Finn Strom Madsen of Vestas saying that one of the company’s current turbine models can produce 300 times as much power as a turbine sold in 1996. “To date, many manufacturers have focused on making the machines bigger, so the towers can reach faster and steadier winds and the blades can cover a larger area,” the story noted, adding the largest onshore turbine now in Europe is a 7.5-megawatt machine made by Enercon. That turbine, the NYT story added, is 135 metres tall and its blades sweep an area 127 metres in diameter. But the article noted that Madsen, the president of technology research and development for Vestas, said that offshore turbines — like the company’s planned 7-MW offshore turbine with a rotor diameter of 164 metres — will keep growing more rapidly than onshore machines. 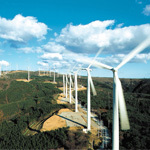 In addition to bigger turbines, the story said the wind power sector has benefited by increasing amounts of research and development work, especially in Europe. “This is probably the most exciting time in the industry as far as companies launching new product platforms,” the story quoted Dan Radomski, co-founder of Kinetik Partners, a company that advises people involved in the clean energy sector, as saying.